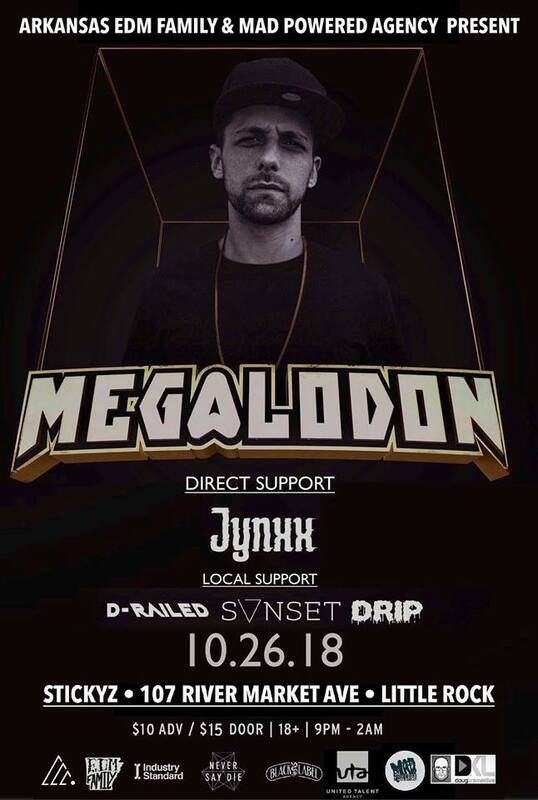 With millions of Soundcloud & YouTube plays, not to mention a string of Beatport Number 1’s, Megalodon is no stranger to the dubstep scene. Since 2008, the San Francisco based producer has seen ever growing demand, touring both North & South America , Australasia and Europe on a regular basis. Megalodon has collaborated with some of biggest and best names in bass music around today such as Zeds Dead, Skism, Habstrakt, 12th Planet, Virtual Riot, Bar9, Antiserum and has gained regular DJ support from major players like Skrillex, Datsik, Excision, Borgore, and Hatcha to name a few. No stranger to the spotlight, his music can often be found featured on some of the biggest music platforms around such as UKF, EDM.com, This Song Is Sick, Rinse FM and the infamous BBC Radio1. Now signed to the world-leading Never Say Die records, responsible for building the careers of A-list acts such as Zomboy, Skism, MUST DIE! and others, few can deny the momentum Megalodon has gained in recent years. His technical mixing style, alongside his dedication to making forward-thinking tracks with a hint of Dubstep’s roots has helped to define him as a standout act, and definitely one to watch over the next year.